PLEASE PASS THIS ON--> Gen. Michael Flynn Still Owes $5 Million in Legal Bills -- PLEASE DONATE TO HIS DEFENSE FUND HERE! PLEASE PASS THIS ON–> Gen. Michael Flynn Still Owes $5 Million in Legal Bills — PLEASE DONATE TO HIS DEFENSE FUND HERE! Michael T. Flynn is an American patriot who honorably served his country for over 33 years in the US Army including five years in combat. Michael Flynn was set up by the Mueller Special Counsel. On January 24, 2017, two of Direct James Comey’s top FBI agents, Peter Strzok and Joe Pientka went to the White House to question Michael Flynn. Former FBI Director James Comey told lawmakers weeks later that Flynn did not lie under oath during questioning by the FBI officials. But General Flynn was indicted by the Mueller witch hunt months later for lying to FBI agents. He pleaded guilty on December 1, 2017. On Monday ABC News reported that General Michael Flynn has shouldered some $5 million in legal bills, a knowledgeable source close to the retired Army officer told ABC News Monday. Michael Flynn was set up and was forced to spend his life savings to defend his name. But now there is a way we can help this American patriot in need. 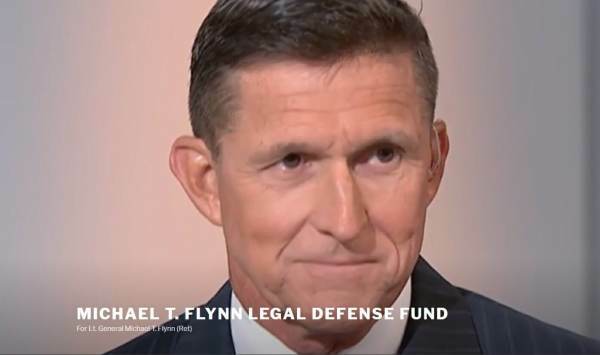 Please donate to the Michael T. Flynn Legal Defense Fund. Please donate to the family in need.